Chia seeds, like the Chia Pet? If that’s your first reaction to chia seeds, you’re not alone. Most people, myself included, are unfamiliar with the culinary uses of chia seeds. Most of us associate them with that kitschy toy that sprouts green grass. Yet using chia seeds in the kitchen is a whole lot more useful that your little green “pet.” They are packed with omega-3 fatty acids, antioxidants, fiber, calcium, magnesium, and iron, among other nutrients. So yes, they’re pretty great for you. 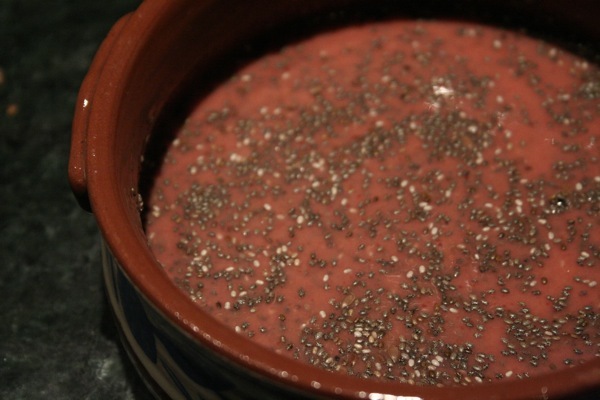 Chia seeds also form a unique consistency when mixed with liquid, creating a gel that resembles tapioca pudding. While this texture might be a little bizarre at first, you easily get used to it. Researchers also believe that this gel-like quality aids digestion, slowing the breaking down of carbohydrates. Chia seeds are rapidly becoming more popular and can now be found at most health food stores or at Whole Foods. They can be easily incorporated into granola, oatmeal, baked goods, and nutrition bars. There’s even a new line of chia beverages, including chia kombucha, although the consistency can be a little odd as a drink. The best way to introduce yourself to chia seeds is chia pudding, an easy concoction that can be eaten for breakfast or dessert. The recipe takes advantage of chia’s gelling properties and creates a sweet, fruit-based and dairy-free pudding. To start, you blend together equal parts fruit and almond milk in a blender, then mix in chia seeds and let it sit overnight so that the seeds can absorb the liquid. If you do it the night before, you don’t even have to worry about making breakfast the next morning. It might even be faster than pouring a bowl of cereal and a whole lot better for you. Hillary Pollak is a senior at New York University, where she studies sustainable food. She is currently loving strawberry season. Place the mango chunks, raspberries, ginger, and almond milk in a blender. Process until smooth, then pour the mixture into a small bowl. Stir in the chia and flax seeds. Cover with plastic wrap, then place in the refrigerator for at least one hour or overnight, until the seeds have absorbed the liquid and reached a pudding-like consistency. Serve cold or at room temperature.